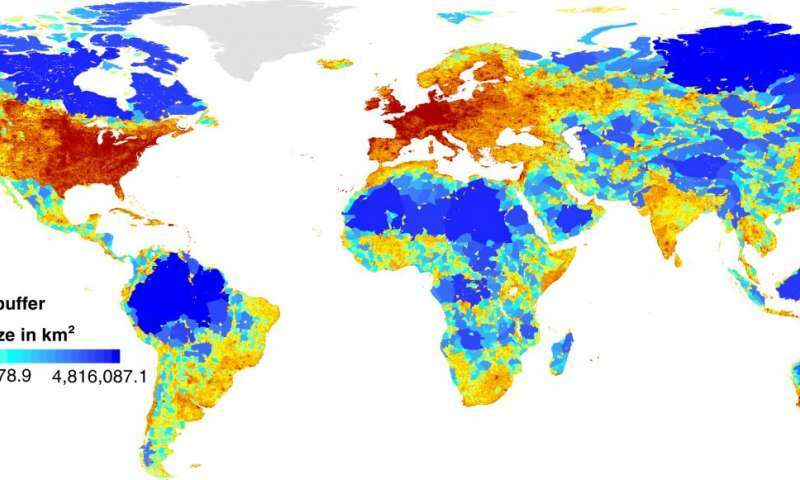 A new global map of roadless areas shows that the Earth's surface is shattered by roads into more than 600,000 fragments. More than half of them are smaller than 1 km2. Roads have made it possible for humans to access almost every region but this comes at a very high cost ecologically to the planet's natural world. Roads severely reduce the ability of ecosystems to function effectively and to provide us with vital services for our survival. Despite substantial efforts to conserve the world's natural heritage, large tracts of valuable roadless areas remain unprotected. The study shows that the United Nations' sustainability agenda fails to recognize the relevance of roadless areas in meetings its goals. 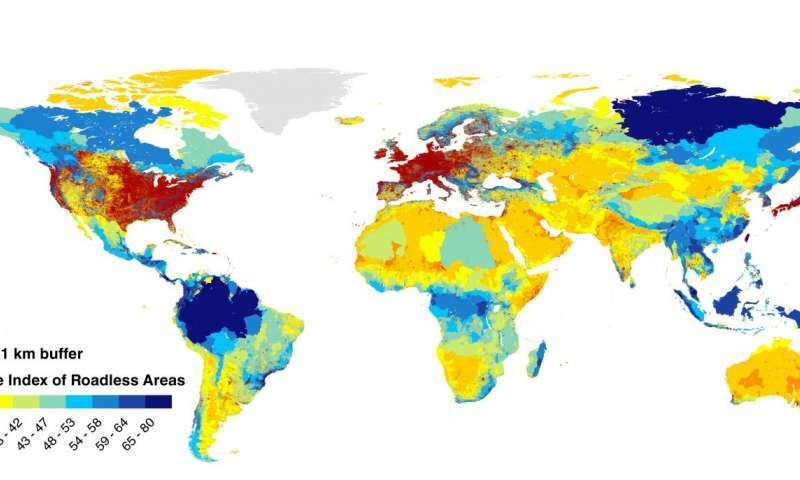 Recent research carried out by an international team of conservation scientists and published in Science used a dataset of 36 million kilometres of roads across the landscapes of the earth. They are dividing them into more than 600,000 pieces that are not directly affected by roads. Of these remaining roadless areas only 7 percent are larger than 100 km2. The largest tracts are to be found in the tundra and the boreal forests of North America and Eurasia, as well as some tropical areas of Africa, South America and Southeast Asia. Only 9 percent of these areas undisturbed by roads are protected. Roads introduce many problems to nature. For instance, they interrupt gene flow in animal populations,facilitate the spread of pests and diseases, and increase soil erosion and the contamination of rivers and wetlands. Then there is the free movement of people made possible by road development in previously remote areas, which has opened these areas up to severe problems such as illegal logging, poaching and deforestation. Most importantly, roads trigger the construction of further roads and the subsequent conversion of natural landscapes, a phenomenon the study labels "contagious development." 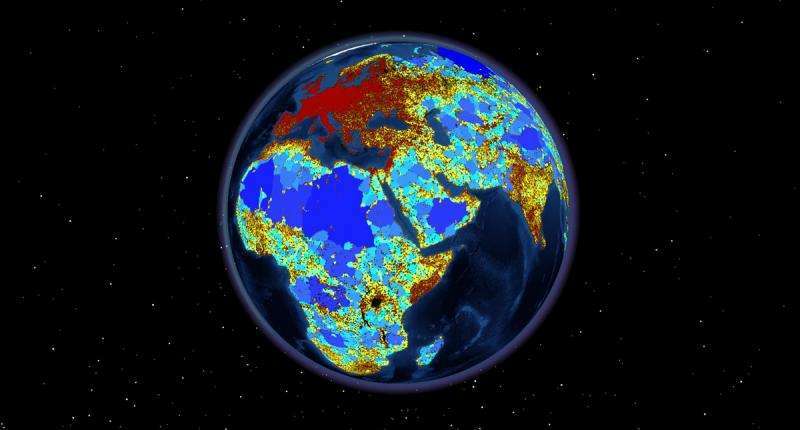 "Our global map provides guidance on the location of the most valuable roadless areas. In many cases they represent remaining tracts of extensive functional ecosystems, and are of key significance to ecological processes, such as regulating the hydrological cycle and the climate," says Pierre Ibisch, lead author of the study based at the Centre for Econics and Ecosystem Management at Eberswalde University for Sustainable Development in Germany. The researchers used a large data base generated through crowd-sourcing, the OpenStreetMap platform. "This was the best available source of information to produce a global map for roadless areas although it was clear to us the data were incomplete. Our figures overestimate roadless areas, and we know many of the areas have already gone or been reduced in size," explains Monika Hoffmann, coauthor from Eberswalde University for Sustainable Development who carried out the spatial analyses. "All roads affect the environment in some shape or form including timber extraction tracts and minor dirt roads, and the impacts can be felt far beyond the road edge. The area most severely affected is within a 1-km band on either side of a road," says Nuria Selva, co-author of the study with the Institute of Nature Conservation of the Polish Academy of Sciences in Krakow, Poland. The study shows that the United Nations' agenda for sustainable development, brought into force in 2015 and now referred to as the Sustainable Development Goals, presents conflicts of interest between generating economic growth and safeguarding biodiversity. Some goals threaten the remaining roadless areas. However, limiting road expansion into roadless areas could be the most cost-effective way to achieve Sustainable Development Goals that relate to preserving the world's natural heritage. The UN Convention on Biological Diversity just held its Conference of the Parties in Cancún, Mexico. Its strategic plan is represented by the so-called Aichi Biodiversity Targets. The Science study shows how this conservation plan ignores the need of safeguarding roadless areas. "As roads continue to expand, there is an urgent need for a global strategy for the effective conservation, restoration and monitoring of roadless areas and the ecosystems they comprise. We urge governments to avoid the costly building of roads in remote areas, which would be ecologically disastrous," Pierre Ibisch concludes. So the alternative is to not build roads? Where do they think the resources that are used to build and power cities come from? The largest tracts are to be found in the tundra and the boreal forests of North America and Eurasia, as well as some tropical areas of Africa, South America and Southeast Asia. Only 9 percent of these areas undisturbed by roads are protected. And I'd have put money on Antarctica. Weird. The title states that roads "shatter the earth's surface" yet only talks about how the roads facilitate access to more and more "wild" areas. What is the "shatter" part all about. Not a sniff about a cracked surface and why, just access issues. I expected an article explaining how the surface is cracked like a dropped boiled egg. No, not a word. Totally misleading headline. "Roads severely reduce the ability of ecosystems to function effectively and to provide us with vital services for our survival"
What?! Our ecosystems are functioning rather well, thank you! But remove our roads? Now there you would find our vital services severely reduced! In fact, we can't live without them. Pathetically stupid article. How about the author go live somewhere without roads. Try the middle of the Sahara!